Gripsweat - mod jazz 45 ERNEST WEST SEXTET Beware Bad Dog WEST HEAR rare! 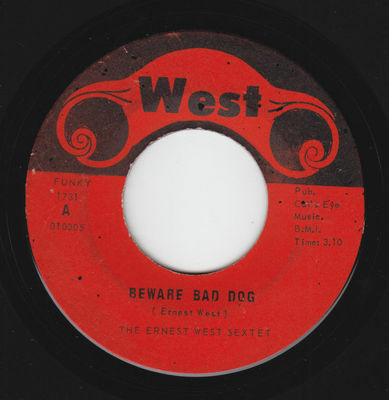 mod jazz 45 ERNEST WEST SEXTET Beware Bad Dog WEST HEAR rare! I am selling a part of my private collection: funk, soul, jazz, folk, classics and totally obscure 45s. Check my other listings, well worth checking out! GRADING: We grade conservatively (m,vg,g) A vg+ record plays great (but may show superficial scuffs). Check my 100% feedback! Items are located in Germany! PAYMENT: Paypal accepted for buyers from outside Germany. Käufer innerhalb Deutschland bezahlen bitte mit der altmodischen Variante. Man muss ja nicht Reiche noch reicher machen.